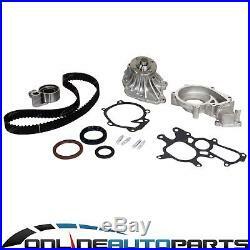 Timing Belt Tensioner Water Pump Kit Prado KZJ95 KZJ120 1KZ-TE 3.0L Diesel Turbo. Kit Contains - "Tora" Engine Water Pump + Housing + Gaskets as per photo3 Oil sealsQuality Japanese Tensioner"Gates" Timing Belt (does not contain hydraulic auto tensioner). "Tora" Engine Water Pump + Housing + Gaskets as per photo. "Gates" Timing Belt (does not contain hydraulic auto tensioner). Engine - Diesel 3.0LT 1KZTE 4cyl SOHC Turbo Prado / Land Cruiser - KZJ90, KZJ95, KZJ120 Reference: ZPN-03711. Link to formulate a question. Or check our Frequently Asked Questions page. But fear not, we have created a table with more specific and relevant fitment information for you. This is a vehicle specific part, please make sure your vehicle is listed in our verified table below. Grande, GX, GX Limited, GXL, Pilbara, VX. 4cyl 1KZ-TE 3.0L 2982cc. Grande, GXL, GXL Advantage Limited Edition, RV, TX. 2003 2004 2005 2006 2000 2001 2002. Search more parts for my vehicle. 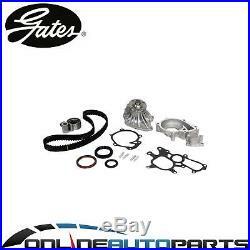 This means that Gates is able to cover the aftermarket with timing belts that are OE-equivalent or better in service life and performance. More than 80% of modern vehicles have interference engines. Choosing a non OEM equivalent belt may severely shorten life and cause major internal engine damage. Timing belt systems in modern passenger vehicles are highly engineered and technically demanding products. As underbonnet temperatures increase as well as belt change intervals, ensuring that the timing belt is manufactured to OEM specifications is critical. For this reason, Gates has colour coded our belt constructions so that it's easier to identify the right belt for your application. Remember, always use the correct construction for your vehicle. Failure to do so could result in expensive repairs. Gates Timing Belts are designed to handle a wide speed range and constant, synchronous drive power requirement common to overhead camshaft applications. Meets or exceeds OEM performance requirements. Most extensive coverage in the industry. Tough, wear-resistant fabric on working surfaces. Special materials resist oil and engine heat. High tensile strength cord construction minimizes stretch. It is always Encouraged + recommended that a licenced workshop or tradesperson carry out the fitting procedure and that workshop manual, Factory Specifications and relevant safety procedures are followed. You can also pay in-Store. Please note that not all items can be combined as they do not pack well together. The wrong item was sent to you. Please choose your parts carefully and make sure you have your correct vehicle information. With your co-operation we will work hard to resolve any issues quickly. Ask a question about this product. Link to formulate a question or check our FAQ. Or visit our store HERE. Head Office + Warehouse location. The item "Timing Belt Tensioner Water Pump Kit Prado KZJ95 KZJ120 1KZ-TE 3.0L Diesel Turbo" is in sale since Sunday, April 02, 2017. This item is in the category "Vehicle Parts & Accessories\Car, Truck Parts\Engines, Components\Timing Components". The seller is "onlineautoparts" and is located in Warehouse - Brisbane Northside - Virginia QLD.